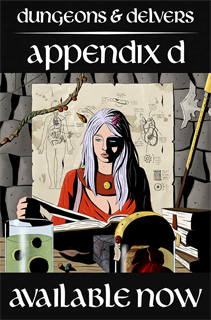 For the next issue of Appendix D, working on the sorcerer, tables to get PCs up to 10th-level, higher-level monsters to go with the new level cap, maybe some more magic items, and some houserules in the vein of 3rd Edition's Unearthed Arcana in case you want to tweak parts of the game (or maybe because you want it to be more like Dungeons & Dragons). For now, here are some of the houserules/conversion notes: lemme know what you think, or if there are rule variants for other things you'd like to see. A big change that will make Black Book like any Dungeons & Dragon edition is changing armor so that it only improves Armor Class (instead of also giving you Damage Resistance). Due to the game's very flat math, I'd consider increasing everyone's Attack Bonus by at least +1. You can drop it in for everyone at 5th-level as a nice sort of "capstone" feature, in addition to what they already get, so fighters and rogues will still be ahead of the curve. If you want to make it like older editions (2nd Edition and earlier), then your full Dexterity applies no matter what armor you wear, though keep in mind back then the best Dexterity bonus a character could really have was +3: here it's pretty easy to get up to +5 without much effort, which means PCs could easily hit an AC of around 23-24 before talents, special materials, and magic items are factored in. You can also allow the full Dexterity modifier if you wish. Note that the AC values are set up in a way so that light and medium can give you a total of 17 assuming Dexterity is maxed out, while heavy gives you 18. Didn't do this where armor gives you DR because, sure, you can be harder to hit with leather and a really high Dexterity, but plate shaves off 5 points of damage every time. If you want to go with Hit Points, just combine everyone's Wound Points and Vitality Points. Easy. Wound Recovery would be the same, unless you also want to change that to something like 1 hp regained per day, 1 hp/level regained per day, or even all hp regained after a long rest (depending on if you wanna do the gritty or heroic thing). Vigor potions instead grant temporary hit points: they don't stack, are removed first when you suffer damage, but wear off after 10 minutes anyway. Abilities and effects that work on VP would probably have a similar effect, while abilities and effects that work on WP probably have the same effect on HP. For example, mending potions and a cleric's Healing domain talent restore HP. Just go with what makes the most sense for you. Attacks and effects that normally only trigger when a target suffers WP damage (like a giant spider's venomous bite) just happen all the time, now. If you want to go really old school you can just scrap skills entirely. Basically everything becomes an ability check: if you want to climb, that's just a straight Strength check. If you want to look for something, that's an Intelligence check. But, since that means the best roll you can get is 25 (assuming +5 ability score and a nat 20), I'd also change the DCs to something like 10 (easy), 15 (medium), and 20 (hard). Clerics: +1 to Wisdom and Charisma saving throws. Fighters: +1 to Strength and Constitution saving throws. Rogues: +1 to Dexterity and Intelligence saving throws. Wizards: +1 to Intelligence and Wisdom saving throws. When a class would get a bonus to their saves (usually at 5th-level), increase those listed above instead. For example, when clerics would get a bonus to their Will saves, they instead get a bonus to their Wisdom and Charisma saves, while fighters would see both their Strength and Constitution saves increase. If you want to do 4th Edition Defenses, you need to flip saving throw modifiers to Defenses, and abilities and effects that require a save around so it's an attack roll instead. To convert a saving throw to a Defense, just remove the plus and add 10. So, if your Reflex save is +3, your Reflex Defense is 13. If your Fortitude save is +2, your Fortitude Defense is 12. These increase when the class gets a saving throw bonus. To convert a saving throw DC to an attack bonus, subtract 10. So, if an effect requires a DC 14 save, it instead gets +4 to hit. Whatever save the effect calls for, that's the Defense it targets. For example, if an effect normally requires a DC 15 Will save, you would instead make a +5 attack against the target's Will Defense. Whoever is using the effect makes the attack roll, and this bonus increases whenever you get any sort of bonus that would increase your saving throw DCs. Defenses basically function like Armor Class: if the attack roll meets-or-beats the Defense, then the target suffers effects as if they failed their saving throw, and if the attack misses the target suffers effects as if they succeeded on their saving throw. Old-school saves (breath weapon, paralyzation, poison, death magic, etc) are a bit more complicated. They usually have static numbers that you roll against, which become lower as you gain more levels. These would be fairly annoying to put in a blog post for every class, so I'll save that for the Appendix D.
We didn't go with pseudo-Vancian magic because it doesn't make any sense, and we don't think that clerics, wizards, druids, bards, and so on should all operate using the same system. So, there won't be any guidelines for giving classes pseudo-Vancian magic (though it shouldn't be difficult to do that on your own, anyway). That said we did add a vancomancer in an earlier Appendix D, so if you want magic to operate more like D&D there you go. Burning Hands: 1d4 fire damage per wizard level, up to 5d4. Evoker: 1d6 force damage per wizard level, up to 5d6. Fire Domain: 2d6 fire to start, plus another 1d6 fire per cleric level, up to 7d6. Fireball: 1d6 fire damage per wizard level, up to 10d6. Healing Domain: 1d8 WP (or HP) recovered, plus another 1d8 at 3rd- and 5th-level. Lightning Bolt: 1d6 lightning damage per wizard level, up to 10d6. Storm Domain: 1d8 lightning damage per cleric level, up to 5d8. No Intelligence or Wisdom modifier gets added to any of them. Also looking into letting you spend more Mana/Favor to boost the effects of a spell. We'll see if that makes it in. It look a lot longer than expected, but we finally released The Jinni. 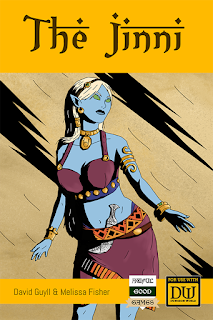 As with our other monstrous classes, this one is more faithful to the mythology (so don't go in expecting elemental-themed jinn). After putting it to a vote, the next couple of classes on the docket are the warden (think 4E D&D warden) and apothecary (gotta go see what they're all about). 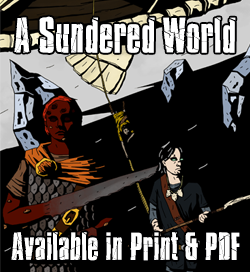 Just released our second adventure for A Sundered World, The Golden Spiral. If a snail-themed dungeon crawl is your oddly-specific thing, check it out! I feel like if your going to give auto scaling damage to spell casters, the fighters damage upgrades after the first should auto-scale for free too. Maybe it needs an actual talent name at that point to make it more clear. Also if your going to restructure ac back to the old system I feel like you will have to re-structure all of the to hit math OR seperate the rules for PCs and monsters. You could leave the ac of monsters unchanged, and just have some sort of scaling to hit bonus for them to still threaten the party. I will post some more thoughts on the ac change after thinking it over some more. I pulled out the black book and compared what's in it wroth your suggestions. I think the more simplified list fits better. Maybe if you switch to this system you should raise hp? What if you flattened hp with ac, and gave classes a "Vitaliy value." When you rest you are able to get your Vitality Value" but points back. @Adam: Technically fighters already get auto-scaling damage (+1 damage at various levels). 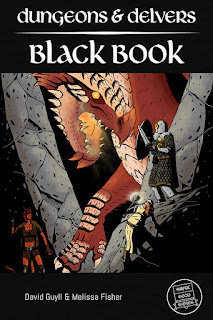 They also don't have to spend anything to attack, which I know was an excuse people used during the 3E days, but spellcasters in Black Book don't have the same kind of power they did before, and fighters get the damage bonus to everything they do. Plus Multiattack is actually accurate (you don't effectively get a -5 penalty for each bonus attack). So a level 5 wizard could be throwing out 7d6+5 damage spells, but that's on a limited basis, while the fighter with a two-hander could feasibly be doing a total of 4d6+12 damage every round, no problem. I'm not intending on changing the core game to AC-only. This is just a, "If you the GM/group just wants AC, here's what I'd do". I like AC and DR and it's been working really well, but I know there are people that prefer just AC, either because nostalgia or it's a bit faster (no factoring in armor piercing/ignores armor and subtracting things). Same deal for abstract: not thinking of changing the core game, just giving people options IF they want to do that, and it doesn't change much (best light armor is +1 AC and 2 DR, but medium armors can range from +2 AC/2 DR to +3 AC/3 DR, with heavy armor capping out at +5 AC and 5 DR anyway. Also going to do an abstracted weapon list, so people can just go with whatever weapon is close enough and describe it however. I HAD considered a healing thing for short rests, something like older-edition Hit Dice, so when you short rest you roll a class-based die (ie, fighters roll a d10) to determine how much VP they get back, but wasn't sure people would like that. It really depends on how long you want to spend resting on top of the long rest for WP: is that something you'd enjoy? I feel like the game is balanced with the dr in it, so if you remove the dr it will be more dangerous and brutal. Also its more fun to hit than to miss so i like the flattened numbers for that reason too. Its just my opion though. What talents does a fighter have to take in order to deal 4d6+12 at level 5? @Adam: I read in 3E's Unearthed Arcana that it was better to have more AC than using DR, because it's better to not get hit at all than to get hit and shave off a bit of damage. Really I think going all AC would just make things take longer because everyone would miss more. It would also make spellcasters even better because save numbers are less. +2 Strength to start, +1 Strength at 5th-level, +1 damage bonus at 1st-level, +1 damage bonus at 3rd-level, Slayer talent (+1 damage with two-handed weapons). Total is +6, and with a two-handed weapon that's 2d6 damage. Double that for two attacks and there ya go! #RPGaDay: Which RPG do you enjoy using as is? #RPGaDay: Whch RPG has the most inspiring art? 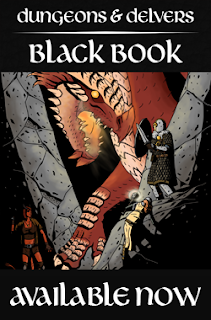 #RPGaDay: Where do you go for RPG reviews?